Forget your fancy Beauty Enhancement, 'slimmest-ever' chassis and geotagging features, sometimes all you want from a camera is some old-fashioned workmanship, with a sprinkle of digital technology thrown in. 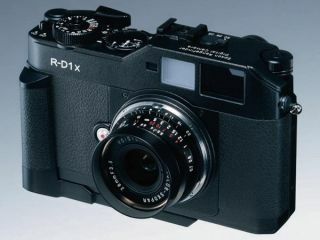 The R-DX1 Rangefinder is a brilliantly retro-looking piece of kit, which sports a 6MP sensor, Leica M and L glass compatibility and a 2.5-inch LCD. Images are copied to an SDHC card, with RAW and JPEG being the compatible formats. Forget what's inside the camera, the best thing about this update to 2005's R-D1 is its chassis. Weighing in at 570g and measuring 42 × 39.5 × 88.5mm, it's a great representation of the Rangefinder cameras of the '50s, which were famed for their focusing capabilities. It even comes complete with an on/off switch shaped like a film wind-on lever. There's no word of a UK release for the R-D1x, but it is out in Japan now for a hefty £1,400.